The South has played a large part in forging the identity of the United States. Its influences include BBQ, country music, NASCAR, and taking life a little bit slower than those in the north. It is the region of good times and good old boys. And if there’s one segment of motorcycles that defines the entire U.S. industry, it’s the heavy cruiser. Nowhere else do these big, bellowing beasts sell in such large numbers. They’re so important, in fact, that 50% of all motorcycles sold in the U.S. are cruisers. And with all that money on the table, the segment is crucial for many brands to be successful in the United States. Yamaha knows this too. 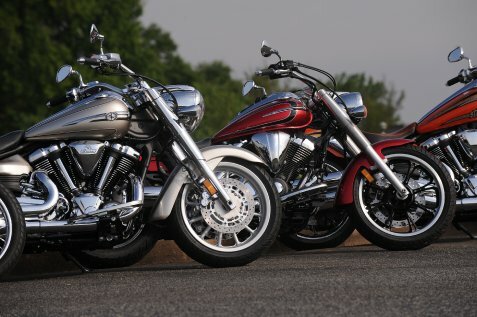 Since 2004, Yamaha’s Star brand has had a double-barreled focus on selling more metric cruisers. So here we are, deep in the heart of Dixie to test Star’s newest motorcycles, because if you find success here, you can make it anywhere in the U.S.
Yamaha is not new to selling cruisers, and neither are their Japanese competitors. Termed “Metric Cruisers,” these Japanese bikes have been available for some time, but like the metric system as a whole, adoption has been spotty at best. Reason being, many of the metric cruisers didn’t have the qualities customers wanted. They may have been more reliable, but they looked flimsy, had plastic instead of metal in most places, and didn’t offer the attitude that cruiser customers wanted. Star’s goal is to create bikes that change those perceptions. Since 1978, Yamaha has sold cruisers. However, customer research showed that this dissuaded many potential customers since they didn’t want to be associated with Yamaha’s supersport products like the R1. They were into style, not speed. So for their more basic tastes and needs, Yamaha branched out their cruisers under the Star banner in 2004. Star has its own team inside Yamaha devoted to giving their customers the experience they want: high style, large customization and a reasonable amount of refinement. With this focus, Star has a full lineup of cruisers to fit a bike for every person and every need. From the starter bike V Star 250, all the way up to full baggers like the Stratoliner Deluxe, Star has a full portfolio that drives home their brand values. Star had all their products available to ride in Atlanta, but one stuck out in particular to show what they are trying to accomplish. Like a pitcher’s violent fastball, the Raider is Star’s big weapon – a rolling showcase for what the Star brand represents. At $14,950, it competes at the heart of the cruiser market. It’s equipped with a big bore 1854cc V-Twin, and is designed to invoke the style of custom cruisers. But the big question is if all this song and dance leads to a superior riding experience than its competitors. Cruisers don’t sell because they can corner with face-melting speed or accelerate like whipped banshees. They sell on looks first, everything else a distant second. Problem is, the cruiser “look” has already been set by the competition – teardrop tank, big V-Twin and a disgusting amount of chrome. This has been the bane of metric cruisers. Customers view them as imitators, and when in the most subjective segment in the marketplace, that’s no place to be. The Raider puts subtle spins on the aesthetic to differentiate itself. It’s still long, low and shiny, of course, but materials and detailing are treated with more refinement. The overall shape is more streamlined; the pipes are swoopy; and as competitors turn away from chrome, Star bought the surplus and applied it to the Raider. It’s everywhere, especially on the S model. It’s an obscene amount of chrome, and the Raider wears it like a rapper wears gold chains: all big pieces, all at once. And it’s all quality pieces too. Fit and finish is exquisite, and no discernable cost cutting was made. Materials are solid, and all the plastic switchgear has proper heft from something to be used over and over again. The overall feel is that it was put together with precision not usually reserved for building big bikes. Plus, if you want to take the Raider to the next level, Star has an entire portfolio of quality aftermarket accessories to make your vision possible. They are also producing a limited run of their SCL Raider. The Star Custom Line Raider is a factory special with only 500 units produced. It’s available in any color you like as long as that is retina searing orange, and has a variety of custom touches such as a two-tone leather seat and even more chrome. The overall theme is a less brash cruiser with more emphasis on custom touches, and it excels in this regard. So, does the Raider look different enough from the competition? Those familiar with motorcycles should be able to tell the difference up close easily without looking at the badge, but from a couple feet away, probably not. It’s just not so different where you can instantly tell if a Star is coming your way. But what if you don’t want to look the part and actually do want to ride in relative comfort? Here is where the Raider excels. It all starts at the motor. This is where cruisers live and die on the sales floor. The engine is the prima donna lead singer of the package: it’s the reason people show up to the show; everything else is filler. The Raider’s 1854cc V-Twin has a lot resting on its shoulders then. It must make all the right noises, make heaps of torque, and have its own personality in a segment that revolves around potato-potato. So, the devil needs to be in the details so that the Raider can have its own personality. Luckily, the Raider’s engine does have these changes. The motor just pulls you forward with nary a complaint, but with a quiet burble instead of a scream. The attitude is there, but toned down. Like a boxer wearing a suit, you know he’s still tough, but he’s more approachable. So is it down on character? Yes, but in a good way. To dislike the motor because it doesn’t torture you so much is like saying that you enjoy your girlfriend less now that she has stopped throwing knives at you. The Raider’s engine provides the cruiser experience without crushing compromises. Ride and handling are the best aspects of this bike. It starts with the aluminum frame that is lighter than comparable steel units. The shocks and dampers are nothing special, but they offer more travel and better damping than some competitors. Additionally, the seating position is low, but you also sit more upright than comparable bikes. These elements combine to create a riding experience that is less nerve-racking. This is still a forward control cruiser, so ground clearance is lacking, but since the suspension is more compliant and you have a touch more road feel, the bike does not feel like its 729 lb. curb weight would suggest. It’s still no canyon carver, but riding the Raider on the back roads of Georgia, on wet pavement, didn’t feel nearly as daunting as I thought it would because of the ride quality. However, the brakes, like everything in its class, are lacking in feel, and the Raider isn’t available with ABS. From the brand that is focused on offering tech in the segment, this is an oversight. To find success in the heavy cruiser market, Star must provide a unique product that is differentiated enough from established competitors. When it comes to looks, the Raider is not distinctive enough. However, ride one and the refinement of the motor and chassis will sell you on purchasing the bike. But in a segment dominated by attitude, Star is facing an uphill battle getting the people onto the bikes to experience its best attributes. Star is heavily focused on that, and the Raider is their best chance to get Americans to try out the metric system for themselves.